You know you've got quality when you play with EVH Premium Electric Guitar Strings. Any product that bears the EVH logo is sure to be of the highest quality. Eddie doesn't just put his name on anything! These strings feature a steel core with nickel-plated steel wraps. You'll love the crisp tone and dead-on tuning these strings provide. 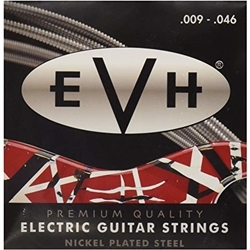 Grab a set of EVH Premium Electric Guitar Strings and see what Eddie knows about strings.